Papers of the Stuart, Baldwin, and Robertson Families, 1859-1926, Accession #10378-a, Special Collections, University of Virginia Library. 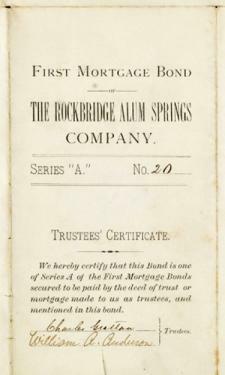 This $500.00 bond for the Rockbridge Alum Springs Company is No. 20 in Series A which was part of an issue of $22,000 that came out in October 1880. An annual interest rate of six percent was promised for five years until October 1885 when the bond was to be fully paid. The coupons at the bottom were to be redeemed for $15 twice yearly.